Comics is experiencing another golden age. What’s exciting about this one is that it’s distinctly contemporary in scope: Artists are producing a wide range of work encompassing and experimenting with a variety of traditions, techniques, genres, styles, and formats. To many, comics is still a medium inextricably conflated with superheroes, but its significance and evolution as an art form continues to be propelled by self-published work, independent collectives, and publishing imprints. Even a cursory roll call of cartoonists making fresh and innovative comics today—Michael DeForge, Jillian Tamaki, Spike Trotman, Ron Wimberly, Jesse Jacobs, Eleanor Davis, and many more—underlines the richness and quality of comics’ current creative landscape. Among these purveyors of excellent work is Brooklyn-based illustrator and cartoonist Kris Mukai. Mukai’s path has followed the traditional, independent creative’s route; she’s been making art and comics since she was a child, self-publishing, printing, and selling her work at conventions. Mukai’s abilities have visibly progressed over time, from her early Ghost Factory strips to eerily impactful zines such as Rabies, the fun Raised By Goblins, contributions to collaborative projects like Kawaii, and the Ignatz-award nominated Il Cammino Delle Capre (“the goat path”) with Zachary Zezima. The past two years have seen her work gain wider recognition: Commuter, her collection of strips on the trials of public transport, won the 2015 Society Of Illustrators MoCCA Arts Festival Award Of Excellence, and her newest book, Weeping Flower, Grows In Darkness, is her most assured work to date. Her illustration portfolio includes The New Yorker, The New York Times, Bloomberg Businessweek, Lucky Peach, Samsung, Boom!, and Fangamer. For Mukai’s fans, it’s been a pleasure to see her work develop over the years, and to wonder at the direction and heights it may yet take. Experimentation with brushes and textures has crystallized into a loose, cartoonish style marked by dynamism and a gift for expression, able to imbue a surprising range of emotional depth. The A.V. Club spoke to Mukai about her career and comics. 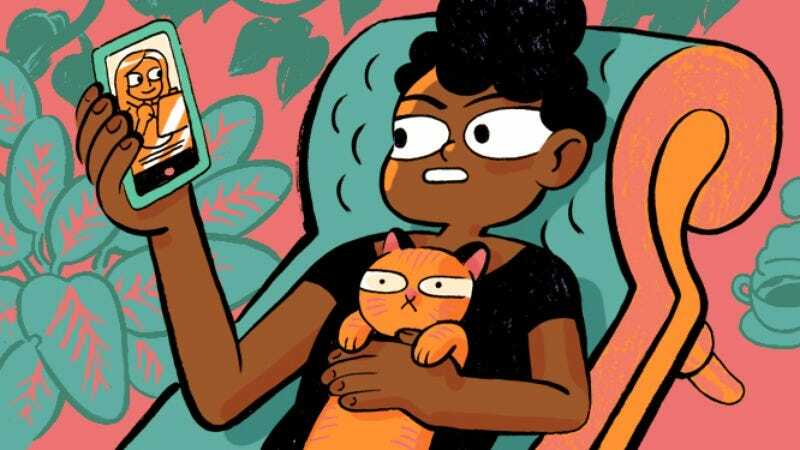 The AV Club: How long have you been cartooning and illustrating? Can you tell us about the trajectory from wanting to do it, to getting started, to where you are now? Kris Mukai: When my parents had AOL around 2000—actually they still have AOL—there was a section called “kid’s art online” or something. It was an online forum for little kids that had a section for submitting comics. You could upload comics and a moderator would archive it on its own webpage. My friend from the forum made a comic about boys that turned into… dogs? Wolves? I forget, but she introduced me to Oekaki boards, so I started drawing on those, too. Through Oekaki I met Saicoink and the Love Love Hill collective. LLH used to self-publish their work under the name Doujisoup, and their books were really thick, almost tankoubon-sized anthologies. I thought it was so cool. Becky Cloonan also used to self-publish a lot of work—she used to table at the artist alley at Otakon. I was like, “This is how it must be done” so I started tabling at conventions, too. Basically I copied LLH and Becky and never stopped. And now look at me. AVC: Did you attend art school or undertake any illustration, art, or comics related schooling? KM: I went to Pratt Institute for communications design, with a focus in illustration. It’s a degree where you learn a foundation of graphic design, advertising, and illustration at the same time. I was also involved in the Pratt Manga Club, which was a new club run by my upperclassman Jane Wu. We self-published a couple anthologies under the name “HATCH,” but eventually the members of Manga Club ended up running the Static Fish club. Static Fish is a long-running student comic publication at Pratt. The school gave us a budget to print books, host events, go to comic shows, and invite guests to talk at club events. It was kind of incredible. I was the president of the club my senior year there—with Anthony Cudahy, Maritsa Patrinos, and Joshua Ray Stephens as a team—so I learned a lot about printing, distribution, and management. AVC: Does your approach differ when you’re thinking and working out an illustration project as opposed to a comic? KM: With illustration I’m handed a prompt and restrictions—size, color, subject matter, time limit. With comics I have to find my own purpose. Illustration assignments I could be done with in a few days, but with comics it could take months just to figure out a story—not to mention comic pages take 10 times longer to draw than a single illustration. It’s a much slower and longer commitment. AVC: How long did it take working as an artist to get to the point where you can make some kind of living from it? KM: There’s a lot going on in this question—we could have a whole other discussion about the sustainability of having a comics career or an illustration career, which are very different career paths in my opinion. It took me a very long time to feel comfortable going to full-time freelance. It wasn’t until maybe seven months ago that I decided to take the jump. The last job I held was at a publishing house that had a very flexible schedule and a really good work environment—I lucked out. It wasn’t too bad for me to take on freelance work after hours, but it was still a balancing act. Sometimes students ask me if I “had” to take on a day job or part-time work. There seems to be an idea that if you have a part-time job, or don’t work full-time as an artist, it somehow makes you less of a real illustrator or real artist. Why is that? Yes, it is difficult to balance a day job and freelance at the same time, but non-illustration work experience is extremely valuable. AVC: Is there anything that looks like a typical day for you—any kind of routine? KM: I just wake up and drink coffee and do the dishes and read Twitter. Other than that it depends on what I’m working on that day. If I’m printing, then I go to my studio, if I’m writing then I usually do that at home. If I’m writing or sketching then I listen to music; if I’m drawing then I have to listen to an audiobook to stay focused. The podcast that I always recommend to artists is The New Yorker: Fiction podcast—readings of fiction pieces that were published in The New Yorker magazine. The host and the guest always chat and discuss the story afterwards. It’s really nice. AVC: You often release a book for big conventions. Cons are important for a lot of independent artists in getting work out there and building a following and community. What has your experience of them been, and what have you gotten out of them? KM: The biggest draw that conventions have for me is just getting to see friends. A lot of my friends don’t live close by, so it’s worth it to me to travel to a show and see someone for a few days. Which is funny because conventions are also kind of nightmares to hang out at, everyone is always so stressed! AVC: Your art is very versatile. It can be very cartoony and appealing, but it’s able to take on all kinds of subjects and themes. How would you say your style developed? KM: I used to draw really dark images with very decorative brush pen lines. I still like using brush pens for illustrations, but can’t draw comics with it. I drew Kawaii very cartoony and I was so happy. Then I tried to draw Il Cammino in a “serious” brush pen style and couldn’t do it. After Commuter I decided that cartoony was where my hand was at. As for themes, I feel like I write about the same thing over and over again, but I’d rather hear what other people think the themes in my work are, and see if they coincide with what I was trying to go for. This way I can gauge how effective my communication is within the work. AVC: You draw great-looking figures that are often quite short, almost stumpy. Is there a particular reason for that, or is simply stylistic? KM: I just like it. I like drawing big hands and feet, so it probably just came out out of that. Lately I’m really impressed with a lot of cartoonists who study animation, like Ariel Ries—who does Witchy—and Kosmic—who does Feast For A King. They’re able to draw people so dynamically and three-dimensionally with only a few pen strokes—it’s amazing. I also like the trope of a short person being the hero—that idea that short people are not easily scared of others because everyone is taller than them already. AVC: There’s a lot of ongoing discussion about representation in comics. Your books often feature women and girls of color as the protagonist—going about life, figuring out and doing things. As an artist is every choice deliberate and intended? KM: A lot of my work is biographical—like Commuter and Kawaii—and so my characters are women. A few people have interpreted the “me” character in Commuter—the one with the ponytail—as a blond, white person. Not everyone picks up that she’s supposed to be me, so people project themselves onto her. Is it a good thing thing for your audience to project their own skin color onto your character? I guess it depends on the comic. For Commuter it’s fine, I guess, but for Weeping Flower I wanted to be very clear that Eleanor wasn’t white. That’s why at the beginning of the book it has her full name—otherwise people would probably interpret her character as white. I have been writing white characters my whole life, and I am tired of it. Lately there’s been a lot of discussion about race and representation in media. There’s a fantastic TED Talk with Chimamanda Ngozi Adichie that sums the issue up perfectly. I’m not very outspoken or into having debates with strangers, so the least I can do is change who and what I write about.